This Survival Bag has what you need to survive with plenty of food & water for one person for 72 hours and contains versatile & reliable products for warmth, shelter, first-aid, and safety. 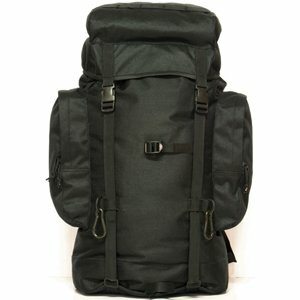 This bag includes: FOX Tactical Rio Grande 75 Liter (Black): 32″x18″x8.5″. Food/Water: 1 2400 Calorie Food Bar Packet; 3 MRE Star Ready to Eat Meals Emergency Food w/ Flameless Heaters; 18 SOS Food Lab 4.22 oz drinking water packets; Katadyn MyBottle Water Purifier. PARACORD-100 feet of Gladding #550 paracord-Black-contains 7 removable inner strands, is made in the USA, is ultra-strong & will not rot. Gladding is one of the suppliers of the U.S. Department of Defense. Adventure Medical Kits SOL Hybrid 3-the Hybrid 3 covers all the bases of outdoor safety: medical supplies, survival tools, and gear repair items to ensure that you and your equipment make it back in one piece. Shelter: Adventure Medical Kits SOL Escape Bivvy (sleeping bag); 2-person Tube Tent; Tarp approx. 8′ x 10′; 6 Coghlan’s 10″ Heavy Duty Plated Steel Nail (tent) Pegs & 50′ Rope; Emergency Poncho and Blanket. Cooking/Warmth/Fire: Coghlan’s 36-Hour Survival Candle w/ matches; 2 packages Coghlan’s Waterproof Matches and 1 package Windproof/Waterproof Storm Matches; Magnesium Fire Starter with striker; 2 pairs of Disposable Hand Warmers. Safety/Tools: Black Kaito Voyager KA500 Dynamo & Solar Powered NOAA Weather/ AM/FM Radio, LED flashlight, charger & AC adapter; Leatherman Super Tool 300 Multi-tool (19 tools in 1); Coghlan’s Pack Axe, Sierra Saw & Mini Shovel w/ Pick;19-LED Flashlight; Work Gloves. Sanitation/Hygiene: 3 N95 Particulate Respirator Mask; toilet paper; soap/shampoo; toothpaste/brush, Shower-in-a-Bag (8 cloths), 12 wet naps, 2 sanitary pad (also use on wounds). We reserve the right to substitute items of equal or greater value.